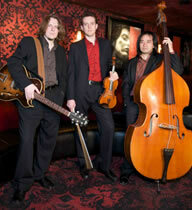 The International String Trio was founded in 1999 by its musical director and guitarist, Slava Tolstoy. During the last 10 years the group has performed at more than 1000 venues across the USA and has gained national recognition for its distinct sound and stylistic diversity. The trio’s repertoire includes classical, jazz, popular and world music (Italian, French, Russian, Jewish, Spanish, Latin American, Gipsy and Irish). The International String Trio has developed a unique concert program that is both highly entertaining and educational, energetic and musically gratifying. The group plays up to 150 gigs a year at venues including: concert halls, jazz clubs, universities, schools and private homes. At our performances we enjoy leading our audiences on a cultural musical journey, as we perform music from countries around the world. Int'l String Trio on NPR!